Blogfest SOCCSKSARGEN 2.0 and Philippine Blog Awards for Mindanao 2011 happening in Gensan! 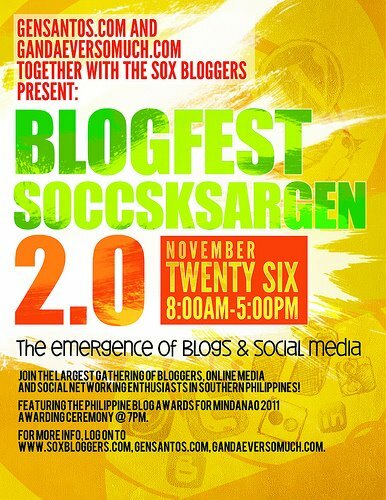 On November 26, 2011 all roads will lead to General Santos City for one of the biggest gathering of bloggers and new media enthusiasts in the country - the BLOGFEST SOCCSKSARGEN 2.0! This year’s Blogfest Soccsksargen is open for everyone, students, blogger or non-blogger, and just like last year, it will feature speakers and facilitators who are prominent blogging stalwarts and web luminaries who will give talks on different topics involving the emergence of social media. An added treat to the Blogfest SOCCSKSARGEN 2.0 is the awarding ceremonies of the Philippine Blog Award for Mindanao 2011, it will recognize blogs and personalities from Mindanao who have made contributions in promoting the best and the true images of Mindanao using the new media. Registration for the BLOGFEST SOCCSKSARGEN 2011 is now open, sign-up now and complete the registration at this link until October 10, 2011 to avail of the Early Bird discount of $5, from the regular registration rate of $6.50. The BLOGFEST SOCCSKSARGEN 2.0 is a joint project of Gensantos.Com and GandaEverSoMuch.Com with the members of the SOCCSKSARGEN Bloggers. South Cotabato News Online and South Cotabato Tambayan are proud members of the Mindanao's Funnest - SOCCSKSARGEN Bloggers.